Last fall, Miss Feige create a DonorsChoose page. Through the past year and a half, Monforton Music has received over $1,000 worth of classroom instruments and supplies - all because of donors as near as next door....and as far away as Japan! The donors from Japan contacted Miss Feige personally shortly after the project "A World Of Music" was fully funded and mentioned that they wanted to continue donating instruments to Monforton. To date, they have donated an Okinawan drum, a Chinese Sanshin, and 2 Chinese Dizis. We feel so thankful to have the opportunity to expose your children to these instruments. Even more importantly, we feel thankful to show students how they are part of a global community and how they can have an impact on people halfway across the world. 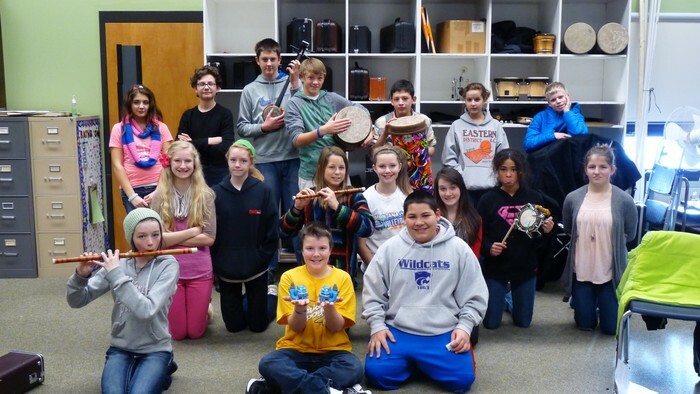 The 7th and 8th grade band students show off how excited (and silly) we are about World Music!